Heat gas or charcoal grill. In large bowl, mix melted butter and ranch dip mix. Coat each chicken breast in butter mixture. Wrap each chicken breast with 1 slice bacon, stretching bacon to cover as much of the breast as possible; secure ends of bacon to chicken with toothpicks. Stack two 18x12-inch pieces of heavy-duty foil; fold edges over, and bring up sides to make a basket. Spray foil with cooking spray. Place foil on grill over medium heat; place chicken on foil. Cover grill; cook 4 minutes. Turn; cook 4 minutes, then turn again, cooking 3 to 6 more minutes or until juice of chicken is clear when center of thickest part is cut (at least 165°F). Remove toothpicks. Serve chicken topped with ranch dressing and dill leaves. Be sure to use thick-cut bacon since regular bacon can dry out and burn on the grill. Fresh dill adds a lovely brightness, but if you’re not a fan, feel free to substitute chopped fresh Italian (flat-leaf) parsley. 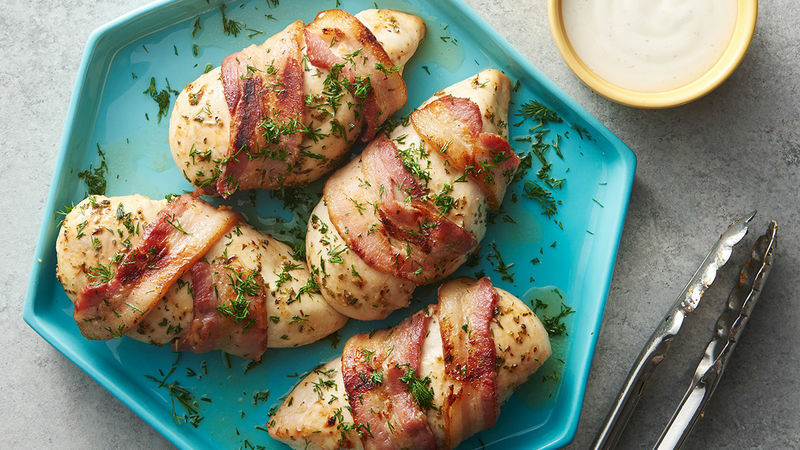 Chicken bacon ranch is nothing new; we’ve pretty much found a way to bring that flavor combo into everything from appetizers to weeknight dinners. This recipe only needs a few ingredients before it goes from grill to gone. Thick-cut bacon is the secret to success in this recipe since it can withstand the grill and won’t fall apart when it’s wrapped around the chicken breast. Experiment with your favorite bacon flavors or even use turkey bacon—just make sure you buy thick cut. We paired this grilled chicken dinner with even more ranch for dipping. If there is such a thing as too much ranch, swap in barbecue sauce for another delicious dipping option. And because you can never have enough chicken dinner recipes, we created an entire page of our very best chicken dinners!